Your mission, should you choose to accept it, is to enter this challenging game to the spin reels while dodging bullets in order to help Ethan Hunt solve high profile international crimes. Click here to play! If you're successful, you'll be given a sizeable reward. As this is Mission Impossible, you'll want to keep your eye out for our silver IMF coin. It only appears on selected reels, but will substitute for nearly all other symbols. There are plenty of other things to watch out for in your mission to ensure a successful completion. Spin one to five trains across an active pay line and you'll get up to 2500 times your line bet. You'll definitely need to defend yourself should you come upon hostile forces. Spin two to five guns and you'll get up to 1000 times your line bet. Also watch out for glasses, cars, passports, fingerprints, retina scans, tapes, smoke bombs and flashlights for a chance to spin in the cash. As you might expect, you'll encounter some surprises and they come in the form of the Ethan Hunt symbol in this game. Spin two to five of these and you'll multiply your total bet by up to 100. 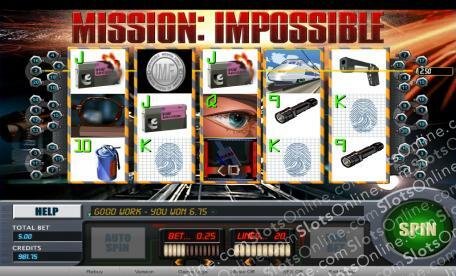 Three or more will trigger the Mission Impossible bonus game in which you'll have even more chances to win. So, gear yourself up for action and adventure that, should you survive, could see you collecting a handsome reward! The Ethan Hunt symbol acts as a scatter. If you spin two to five of these across a pay line you could multiply your total bet by up to 1, 3, 10 or 100 times respectively. Three ore more left to right or right to left will trigger the bonus feature. You will trigger free spins if you spin a fingerprint on reel 1 and a retina scan on reel 5. The silver IMF coin acts as a wild symbol. It only appears on reels 2, 3 and 4, but it will substitute for all other symbols except the scatters. If you spin three or more Ehtan Hunt scatter symbols right to left or left to right and you will trigger the Mission Impossible Bonus. This feature will see you attempting to help Ethan through a mission. You need to follow instructions to help him through different stages. With each completed stage you will be rewarded. If you choose the wrong selection, your game will end.